A party with plenty of class and no troubles. 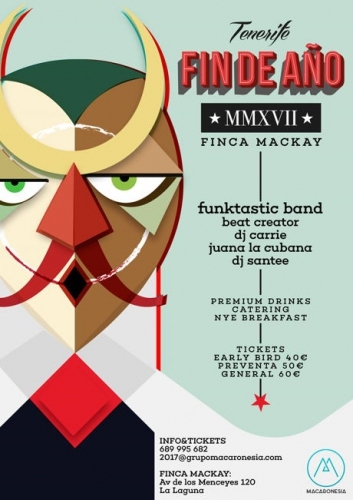 The historic event venue Finca Mackay is hosting a NY bash which promises to be a night to be remembered in good company and music in the north of Tenerife. The venue is surrounded by greenery and has ample open spaces to chill and have a boogie. The tickets cost 50 Euros and include churros and chocolate, a free bar and a fantastic line up of live bands DJ's inclduing the Funktasticband Disco-Music. The event begins at 00.30 and goes on until 6am. Buy your entrance here: http://www.tomaticket.es/entradas-fiesta-fin-de-ano-finca-mackay.